As reported by the Connecticut Department of Energy and Environmental Protection, garbage created by Connecticut residents is approximately 5 pounds per day. This is why companies, and residential waste management in CT is of great concern to the state and the residents. Individuals and businesses can both do their part to help decrease the amount of waste that is placed in landfills every day. Below are 5 tips for better waste management at home that can be started today, and utilized by both families and companies. State law in CT insists that metal and glass food containers, as well as plastic with resin codes 1 and 2 be recycled. Clothing can be donated or traded with other families. Even though the state does not have a collection program, people and businesses can compost their own food scraps. Large composters need to be placed in an appropriate place. 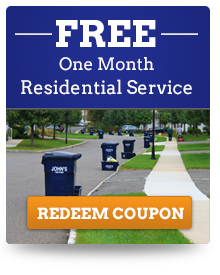 A good residential waste management company in CT will be able to provide information on where a composter can be placed on your property. Most grocery stores now sell inexpensive material shopping bags. These are not only better for the environment but they are stronger than any plastic or paper bag available. Paper is the recyclable material that is thrown away the most, last year alone about 4.5 million tons of paper were thrown away. Junk mail is a large part of garbage waste, call your local Post Office to see how you can be removed from any undesired mailing lists. Another great way to reduce the amount of paper you use is to switch out paper towles for rags, that can be washed and reused. Use cups that can be washed for drinks, instead of individual plastic bottles. Reuse any plastic tubs that food is packed in (many cold cuts are packaged in these). Practicing residential waste management could conceivably reduce the amount of garbage placed in landfills by thousands of tons per year. A good waste management company in CT will advise residents and businesses on what choices they have when it comes to recycling, and give ideas on how to reduce the amount of trash they accumulate. Reduce Paper Products like junk mail, magazines. Use rags instead of paper towels, they can be washed and reused. Interested in learning more about reducing your household waste, contact us today!